In my path to psychological growth and personal development I have found several images that I think have captured the complexities, joys and challenges of my life as a woman. In my research I’ve become mesmerized by all the sacred places built to venerate the Great Goddess in ancient cultures. Her presence was so alive and vibrant and I longed for that presence! (See Sacred Feminine). Somehow that longing took me in a subconscious journey to find that Sacred Goddess in my life. I searched, read, collected images, and painted images. I danced, choreographed and ultimately got tattooed. I recently purchased the Goddesses Book and the Goddesses Knowledge cards, both with illustrations by Susan Seddon Boulet. I have been a fan of her work since I started researching the Sacred Feminine in 2004. Sometimes even without knowing that it was her work, I was fascinated by the imagery. So much so that even three of the four large tattoos in my body have been adapted from her paintings. And the more that I have been able to discover her work, the more I have been tempted to get more ink work done! Psychologically speaking it is believed that all human beings embark on a HERO/HEROINE journey to self-knowledge in which they are faced with many obstacles and challenges. We usually call them our growing pains. I often think of the Egyptian, Greek and Roman myths and the great epics they contributed to form Western Civilization and that in a way are still part of our collective consciousness nowadays. I also think about the Patakis – stories and myths of the Yoruban Orishas (deities) and the reflection and guidance they are meant to offer to their communities. I can identify with these archetypal collective myths and stories as I see my personal and professional life as a series of journeys in which I’ve submerged, drowned, walked, crawled, run, struggled, battled, danced and loved. Clarissa Pinkola-Estes writes that all women belong to a scar clan. We have all been marked by our lives and have scars (physical or psychological) to show for our battles, defeats and victories. It was recently then that as I observed the transformation of my body that I realized that my tattoos were not only the scars that had welcomed me into the clan of soul searching heroines but also that MY BODY had become a “Shrine to the Goddess”. My tattoos hold the images that are sacred to my journey. My acquired love, trust, vulnerability, and wisdom have been literally carved out of my body. They have been imprinted on my skin. I went through a love hate relationship with tattoos since I was so opposed to them when I was a teenager. I felt that I didn’t want to give in to peer pressure by getting one (my brother had gotten one when he was really young). I also knew that it was a huge commitment and I didn’t think that people really took the time to think about what they were getting themselves into. But that was the young, naive, somehow lost and judgmental Pamela speaking. In many ways I love the convictions and strength I had as a teen but I now know that I was very disconnected from myself back then. I had grown up trying to please people. Finally when I was 18, a lot of what I knew fell apart (see Healing the Soul) and that is when I truly embarked in my Heroine Journey. My dreams had always been so vivid and somehow I wanted to capture their intensity and bring them out to the material world. I knew they offered me guidance and wanted a waking image to remind me of the path they were signaling for me. I don’t remember exactly how it happened but the option of getting tattooed started becoming very attractive. So after developing an admiration for them and seeing them for its artistry, I finally decided to get tattooed. It took me more than 3 years to do it. It was a big commitment and I knew my body was going to change for the rest of my life. I received a scholarship from the Sisters of Color Ending Sexual Assault to participate in a conference in Puerto Rico. In one of our closing events I picked out the Triple Goddess image (See Sacred Feminine) by Susan Seddon Boulet out of a deck of cards. At that time I didn’t know who she was. That trip to Puerto Rico in many ways brought me back to life so the fact that I got that card there meant a lot to me. I have kept it all these years. So when the time came to choose an image for my first tattoo, I wanted something that was similar to the Triple Goddess Card but was not sure if that was possible. So when I had my consultation appointment with Jason Shroder, my tattoo artist, I showed him the card and he mentioned he had one of Susan Seddon Boulet’s books. It was meant to be I thought. That is where I found Mary! The name of the artwork read “The Annunciation”. The moment in which Mary is told that she is pregnant with Jesus. I was so mesmerized by the image. As coincidence will have it, I had done a lot of research about the Virgin Mary. I had wanted to transform her image. I wanted to transform the meaning of virginity. In the words of a dear professor of mine, I was on a mission to re-virginize the world! And to add to that, in Afro-Cuban tradition the symbol of motherhood, Yemaya, was syncretized with Mary. She belonged in my body. And so it was, I began my first tattoo on a March 23, the same day my maternal grandfather had passed away 24 years before. I saw it as his blessing. After getting my first tattoo, I was mesmerized by the entire process. Mary had started the beginning of the story, but there was so much more to be said and written. I was determined to get more. I spent some time searching for images that could assist me in my journey. That is how I found Oshun, the Yoruba Goddess of love, sweetness, diplomacy. To my surprise the artwork I had found was yet another piece by Susan Seddon Boulet, although I don’t know the exact name of the art work. Every since I became involved in the Cuban and Brazilian culture, I had a deep admiration for this Goddess of Love. I had constant dreams of me chasing after her. So 9 months after getting Yemayá, I got Oshun imprinted in my body. A few months after that I had a reading done by a Mai de Santo, a Candomble Priestess, and I was told that I was the daughter of Shangó, the Orisha of Thunder. He represents justice, balance and virility. He is an avid dancer. I was also told that my spiritual mother is Oshun. So guiding and protecting me were the ultimate female and the ultimate male. That felt true. In many ways I always felt that a combination of masculine and feminine energies have been part of my life’s experiences. At the time I had started to have a lot of dreams of snakes. Sometimes I was afraid of them but the more I dreamt of them, the more I became comfortable, although cautious, with them. Snakes are ancient symbols of the Great Goddess but the also represent sexual energy and regeneration. I also began having dreams with lots and lots of cats, actually I have always dreamt of them. Some people associate the tiger or lion with Shangó since he is said to have been an African king. Since I already had the symbol of my protectress, Oshun, I saw fitting that I get a tattoo of my spiritual guide, Shangó. I knew I wanted a double axe because that is the instrument he dances with, but I also wanted to represent his sexual energy through the snake. 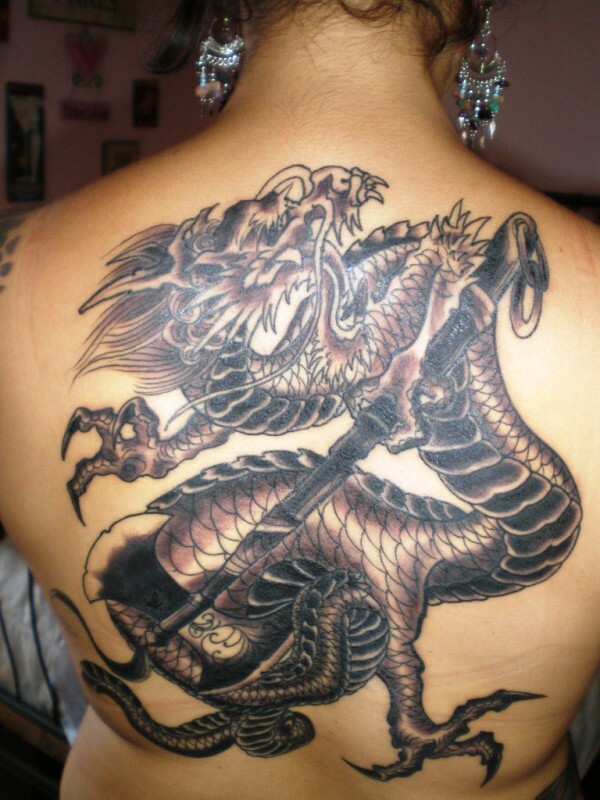 I chose an ancient relative of the snake and picked the image of a dragon. 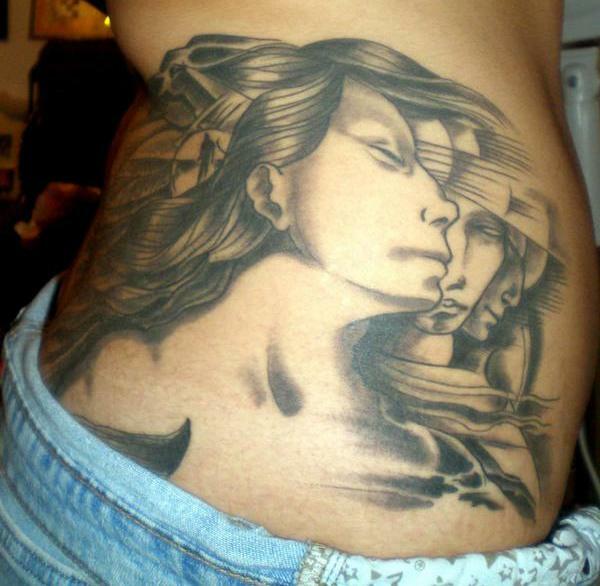 That is the only tattoo in my body that was fully designed and created by my tattoo artist. It was such a contrast from the other two tattoos, but I welcomed the disparity, so to speak. Those two complete opposites, masculine and feminine truly expressed who I was. I got my dragon, Shangó, tattoo on my 28th birthday, 6 months after my second tattoo. So far it has been the most painful and hardest to sit through. I knew I wasn’t quite done yet but the memory of pain from my third tattoo kept me away for a while. It was literally days after getting Shangó that I found the fourth image that was meant to be in my body, but I decided to wait. If it needed to become a reality, it needed to happen when I was both, emotionally and psychologically ready. And so I waited. A year and a half after my dragon, I decided to get my fourth tattoo. The image that I had found before keep calling me and not surprisingly it was done by Susan Seddon Boulet. There was something about it that kept me hypnotized. After another reading by the same Mai de Santo, I was told that the path of my Shangó was Airá. He lives in the house of Oxalá/Obatala. He is the creator of human kind and represents peace. One of his symbols is a white dove. 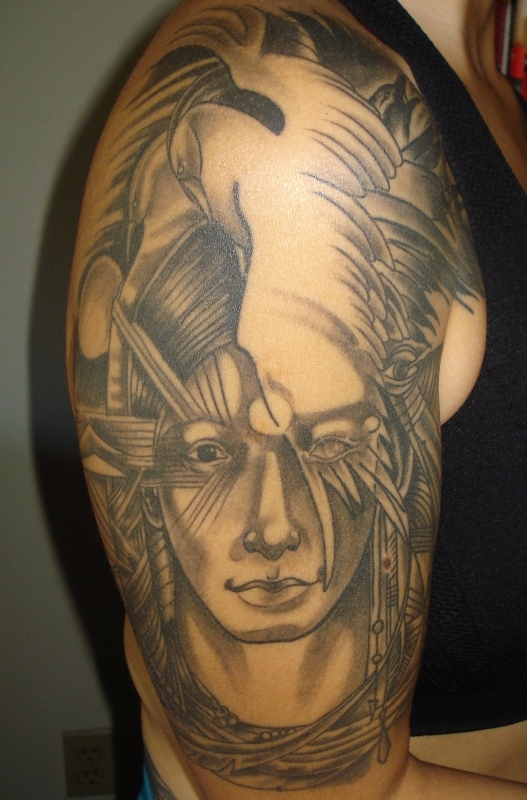 The image that I had found, named Shaman had a couple of doves on the head of this almost androgynous figure. It could be male or female. This tattoo is the one that has taken the longest, three sessions in total. My last session was on March 3, 2010. March 3rd was the date in which my grandfather was born. So in a much unplanned coincidence, I started my tattoos with his death and I ended them with his birth. How is that for a spiritual guidance? Mostly my new appearance has been well received by people. Most have been excited for me as I’ve engaged in carving my spiritual journey on my skin. Unfortunately I also had to deal with much criticism from unenlightened people that perhaps thought just as I did when I was a teen that tattoos were only indicative of a life that was not “fit” for a “proper” member of society. My mom was one of those people and she has had a hard time adjusting to my transformation. Many times she has thought that I had done it just to cause her pain. Other people have thought that I have been punishing myself for something and wanted to endure that pain because of it. Wrong!!! Although it was hard to hear harsh criticisms, especially when I visited my family in Ecuador last December, I knew I have been true to myself. 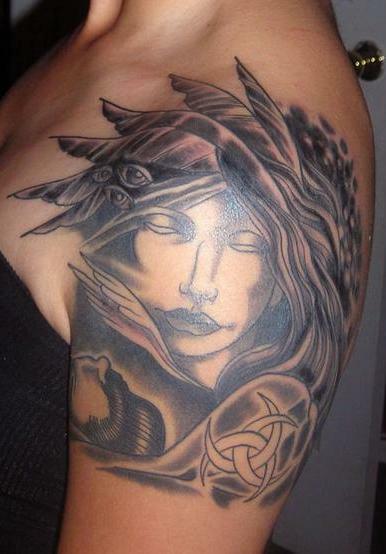 My tattoos are part of my emotional, psychological and spiritual transformation. Even when there was pain, I embraced it as part of the battle. The carving of my skin was the marking of my experiences. The pain of the needles puncturing my skin got me in a trance state that allowed me to figure out my path. Mary signifies trust, seeing without being able to see. Oshun represents vulnerability and the willingness to open up. Shangó is there to protect my core and watch my back. He is there to give me strength. Obatalá provides balance to my life and allows me to truly see. One eye is in the material world and the other eye is in the divine. These are the scars of my warrior years. These are the “scars” that are healing my soul. I don’t know how the rest of my path will look like. I think I am done with tattooing for now. Perhaps when I begin another transformative stage in my life, I might need to suite up yet again and get inked, but for now I am content with the stories my body tells. I am mesmerized by the divinity I find in it. I am in love with the Sacred Shrine it has become!